Depression can be devastating and even fatal. I have struggled with depression for as long as I can remember, and I know of what I speak. I’m choosing to convey a positive snapshot inside the devastation of this mental illness that thousands of people suffer with daily. I never would have thought that I could have gleaned anything positive from my illness; but I have begun to see my struggles in a new light. I truly believe and embrace that thorn in my side, my depression, has kept me alive. All the anger, self-hate, violence and turmoil it caused was necessary to keep me grounded. I was so prideful and vain that I blamed God for putting a curse on me. I constantly asked Him, “why me?” I hated the world and most of the people in it. It grew to the point I was literally at war with the world and with myself. I was a “Rebel Without a Cause.” All I wanted to do was fight something, someone, anyone because the only time I felt alive was in the eye of a hurricane. I was on a dark and lonely road. Anyone who has been there will be able to relate to what it feels like. For me, reading the Bible began to change something inside of me. As I read of the trials and tribulations of Apostle Paul, I began to experience immense joy and horrible sorrow at the same time just like he did. I could not understand how this was possible. 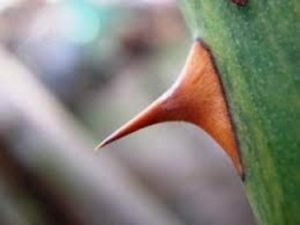 however, Apostle Paul’s asked God three times to remove the thorn in his side, only to have God say, that His grace was enough and the thorn remained. I have read Paul’s epistles over and over and each time, I receive new knowledge of what God meant. When I began blogging and removed the mask I wore daily, it was one of the hardest things I ever did. I had hidden my suffering so well for most of my life and to expose it now publicly was so scary. However, as I swore to myself and God, if I ever found an answer to my question, “why me”, I would tell the world every chance I got. The depression protected me from my worst enemy, me. It humbled me. It kept me looking to God rather than myself or others. It kept me fighting to overcome it rather than fighting because of it. It’s the thorn that holds everything together. I have been to places where dark images abode. You’ve hardened my heart and filled me with pride. I wasted so many years in fear of you. I will warn you what awaits you around the final bend. Though you will try it, you will only swerve. To the place where you finally run out the track. No more highs where your mind can run. I warn you that this is no child’s game. It takes you back to where you’ve always been. And this is the one choice only you can make. Only the black raven that will take your soul. Despite suffering in silence from chronic depression and bipolar disorder, I have managed to live a productive life. I graduated from Marshall U. with a B.A. and became a Social Worker. My fight as a social worker is to bring the effects of depression on our society into the social discussion. My experiences with persons in need of help to develop a safe home environment for their children as ordered by the court gave me a clear insight to how mental illness affected these families. I admire the courage it takes to come forward with your struggles as you have. Very well written. THANKS, JEWEL, WE HAVE BOTH PAID OUR DUES I THINK. Nick this is a powerful blog and it tells so much about depression and the dark hole we find ourselves. and our struggles to get back into the light! Well done Nick! Thank you Pamela. Both of us being social workers, I find we are so much alike in our passion to rid society of the stigma it currently holds. Wow Nick this is great. You are shedding so much light on the deep dark subject of depression. This blog is gonna help even more people than you’ve already helped. And again, thank God it’s brought you out of your dungeon. Keep on rolling friend. By the way,, poem is awesome too!!! Thank you so much, Anita your taking the time to comment means a lot to me, my friend. You are a remarkable man. I admire your courage to share your story and face the demons that held you captive for so long. Anger is something that causes so much turmoil for both you and your family. Therefore, I am very glad that you are no longer dealing with it and I am sure your family is too. Everyone has issues, good days and bad; if anyone says otherwise, then they must be in living in a bubble. 🙂 You are making a difference in the lives of others, which always helps. As you have already learned, God gives us hope and helps us overcome anything, as long as we ask. Also, I loved your poem. I hope you and your family had a happy New Year and continue to have a wonderful year. Diana, I honestly thank you tor that, I really needed it today. You have extremely good insight into life’s obstacles and how we face them. What you wrote was beautiful, thanks again, Diana. God bless. Thanks for taking the time to comment, Jaelyn. I feel that we need to lift one another, Champ. Thanks for taking the time to comment. Well said, Ziggy. Thanks for taking the time to comment. Brandi, I feel that the more we discuss our trials regarding mental health, the less stigmatized we are. Thanks for taking the time to comment. Nick , you have helped me in so many ways , since I’ve joined your prayer group and I so can relate to your blog , I’m up then down , and like you , the bible is my leverage ,and God helps me with his word to not act out my bipolar depression, symptoms , even when I tsme my meds , they don’t seem to work ,I get so down ,like quick sand , then , I find my mind reciting scripture, I never even planned , so I know it’s God , the apostle Paul , my favorite , said ” I have learned to be content in whatever state I’m in ! The apostle Paul took being chained up in prison and he sang songs of praise to the Lord , when the ship they were in stopped, he stayed in the ship and could have escaped but he didn’t , because he trusted God , because faith is the substance of things hoped for , the evidence of things unseen , this is how we must think , believe and remember, also , nothing is impossible with God ! Jesus is n charge of us , not we ourselves , he orders our steps , but when we walk away and do our own thing, well our symptoms or I’ll say , mine , seem out of control until I hear an inner voice from the word of God , hank you Nick ! So many people need you , you are an inspiration and an encouragement and an educator ! Please keep on rolling , you are sooo needed . Thank you so much !!! !.